For the IAS aspirants, we have provided a detailed synopsis of the Smart Cities Mission which was launched by the Prime Minister of India in which can be asked in IAS Exam. The article is based on the editorial of The Hindu, an authentic source of current affairs study material for IAS Exam. The Smart Cities Mission (SCM) is a visionary mission of the government of India. Based on the SCM, questions can be asked in IAS Exam, so the IAS aspirants should have proper understating the Smart Cities Mission and how it will affect the infrastructure development in the country. Around 81 out of the list of 90 cities under the Smart City Mission (SCM) seek funds for affordable housing, new schools and hospitals, and redesign of roads. There are a lot of aspects other than the funds required to achieve the goal of urbanisation of cities in India. It seems that the government has decided to evade such a fundamental problem by adopting a ‘managed urbanisation’ approach in the chosen cities, with the powers of municipal councils delegated to a Special Purpose Vehicle (SPV), under the Companies Act, that will act in its own wisdom. Given that this is the model adopted by the two-year-old Mission, the Government must present a status report on what the SPVs have achieved so far. 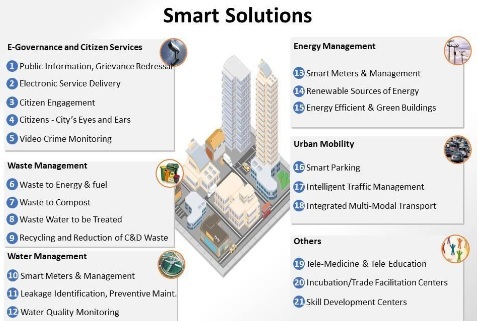 The concept of smart city varies from city to city and country to country, but in case of India, the concept of smart city is that it has to provide for the aspirations and needs of the people of the country, urban planners ideally aim at developing the entire urban eco-system, which is represented by the four pillars of comprehensive development-institutional, physical, social and economic infrastructure. The strategic machinery of an area-based development in the SCM are a city improvement (retrofitting), city renewal (redevelopment) and city extension (green-field development) plus a pan-city initiative in which smart solutions are applied covering large parts of the city. 8. Applying Smart Solutions to infrastructure and services in area-based development in order to make them better. For example, making Areas less vulnerable to disasters, using fewer resources, and providing cheaper services. For the Government, it will be very challenging to improve the quality of life in choosing cities, but it will depend on how the Central and State governments are approaching the data regarding the evolving needs of the communities in the country. The smart initiative will be taken to estimate the flow of vehicles and pedestrians, for instance, a sensor will estimate the flow of vehicles and pedestrians and create Smartphone applications for the public to report on a variety of parameters. There are several international examples now, such as the Array of Things sensors being installed on Chicago streets, which let people download the raw data on air quality, transport, pedestrian movement and standing water. Making such estimated data open would enable citizens’ groups to themselves come up with analyses to help city administrators make decisions, boost transparency and make officials accountable. India’s Smart Cities Mission has identified more than 20 priority areas; interventions by the respective agencies are weak. Access to special funding should make it mandatory for all public transport providers — city bus corporations, Metro Rail and suburban trains — to provide real-time passenger information in the form of open data, an inexpensive global standard that raises both access and efficiency through Smartphone applications. Making street-level waste management, data public would lead to a heat map of the worst sites, compelling managers to solve the problem. Clearly, there is a lot of low-hanging fruit on the road to smartness, and a nimble policy approach can tap this quickly. More importantly, the ideology that guides the plan should recognise that the vibrant life of cities depends on variety and enabling environments, rather than a mere technology-led vision. Pollution-free commons, walkability and easy mobility, with a base of reliable civic services, is the smart way to go.